Bangladesh Prime Minister Sheikh Hasina, who is on a four-day-long state visit to India, has brought with her gifts for the Indian leadership, including the President and the Prime Minister.Prime Minister Hasina has brought a Panjabi pair of silk pyjamas, artworks, a dinner set, a leather bag set, four kilogram of kalojam and rosgolla, two kilogram sandesh, 20 kilogram of hilsa and two kilograms of yogurt for Indian President Pranab Mukherjee. Bangladesh Foreign Ministry sources were quoted by the Daily Star as saying that there was also a silk sari as gift for the Indian President's daughter Sharmistha Mukherjee. She has also bought a Rajshahi silk sari for Prime Minister Narendra Modi's mother. She would give West Bengal Chief Minister Mamata Banerjee a Benarasi sari, two kilograms of rosgolla and kalojam, one kilogram of sandesh and two kilograms of yogurt. Prime Minister Hasina arrived in New Delhi on 7 April, 2017 to kickstart her four-day state visit to the country. "Delighted to welcome H.E. Sheikh Hasina, the Prime Minister of Bangladesh, on her State Visit to India. PM Sheikh Hasina and I are determined to take the relationship between our nations to a new level," Prime Minister tweeted. 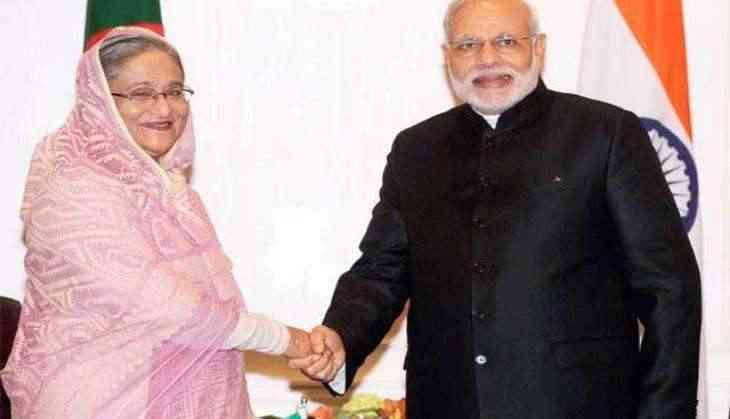 Officials from Prime Minister Hasina's entourage took selfies with Prime Minister Modi.